“This is our most unsuccessful wine.” It’s not the usual introduction to a wine but Miha Batič isn’t a conventional winemaker. He comes from a family that didn’t release its best-ever vintage “for fear that wine connoisseurs would grow spoiled by the taste”. He serves the 1999 vintage to friends at his home in Šempas, in Slovenia’s Vipava Valley. “Only the best is good enough for them,” he says. Miha is one of the country’s growing band of organic and biodynamic producers. He believes wines are ‘born’, not made, and that the densely planted vineyards where they are conceived should be full of life – “with an orchestra of micro-animals who sing”. When this ‘singing’ (ie. vitality) attracts snails, they are dealt with by ducks. Sheep deal with the grass but there is a high-tech solution to mildew – a large tractor-mounted contraption that blasts hot air at the vines. Visits to the cellar and tastings from the mulberry and oak barrels are precluded because “all healthy grapes need in the cellar are peace and time”. Instead, Miha is taking me through a flight of Batič wines in the family dining room while his two young sons, Angel and Oskar, charge through on Heelys and toy trucks, armed with a rake and a plastic sword. Batič’s most unsuccessful wine is his Sauvignon Blanc. The 2009 in my mouth has a hint of spice that comes from 15 months in a Slovenian oak barrel and a richness that comes from maceration. The 2009 that’s still in the glass is almost amber. The aromas are minerally, peppery and utterly buttery. Grilled pineapple is the main fruit note. This is a Sauvignon Blanc that has been made for ageing, I’m told. It certainly has not been made for lovers of Marlborough wines. And it’s certainly not what I have come to expect of a Slovenian Sauvignon Blanc. This small EU country, about the size of Wales, has been gaining a good reputation for its Sauvignon Blancs over the past ten years. In 2014 one of its producers, Ptujska Klet, picked up two Regional Trophies at the Decanter World Wine Awards: one for its fresh, aromatic Pullus Sauvignon 2013 and another for its more layered Pullus G Sauvignon 2013, which combines grapes from different passes and soils. This technique of blending grapes of different ripeness levels and from different sites to express the variety’s full character in one glass is becoming more common in the east of the country, close to the Austrian and Hungarian borders. Verus uses Sauvignon Blanc grapes from 10 to 15 different parcels of land, with different aspects, inclines and soils. 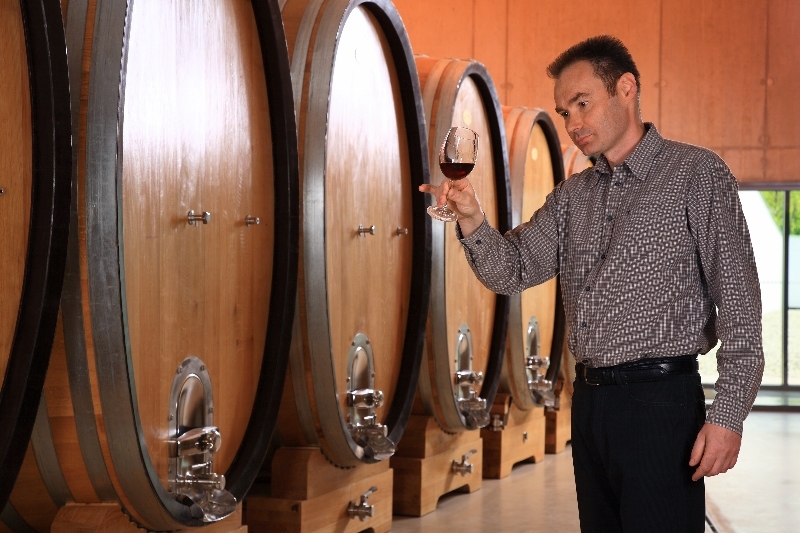 “One site is good for body, another for freshness,” says Verus’ winemaker, Danilo Šnajder. Note the colour of his Pinot Grigio. Avoid pale imitations! In the west, where Batič is based, near the border with Italy, making long-lived expressions of the terroir seems to be the priority. The Sauvignon Blanc Selekcija 2012 from Marjan Simčič, for example, was made with 70% grapes from the Italian side of the border in Collio and 30% from his Slovenian vineyards, picked several days apart, macerated for a week and matured for 12 months in large (4,000L) conical-shaped barrels before being moved to 500L oak barrels for a further nine months of ageing. This intense golden-coloured Sauvignon Blanc is then bottled without filtration. The Pullus G has aromas that range from green pepper to passion fruit; the Selekcija goes from sage to tobacco. Their Pinot Gris also illustrate the divide between the east and west. Pullus’s has a slight pink hue; Simčič’s is copper coloured and, after 10 days of maceration, Batič’s is redder than his most successful wine, his slightly effervescent, semi-dry Cabernet Sauvignon rosé. But all, fortunately, are a million miles from most of the Pinot Grigios being produced in neighbouring Italy and show their Pinot Noir heritage here. It’s a fitting position for Slovenia to occupy as it is a relatively new country, gaining independence from Yugoslavia in 1991 and joining the EU in 2004, but it has a long tradition of winemaking. People have been making wine here for more than 2,500 years. The Batič family can trace their winemaking traditions back to 1592. Another winery, Dveri-Pax, can trace its winemaking roots to 1139. The cellar in Ptuj used by Ptujska Klet goes back to 1239. Erzetič, which has one of the most impressive new cellars – including a room with 12 amphorae buried in the ground – has been making wine since 1725. The country’s leading sparkling specialist, Radgonske Gorice, has been using the méthod champenoise since at least 1852. And Slovenia’s second city, Maribor, is in the Guinness Book of Records with the world’s oldest vine (reckoned to be at least 400 years old in 1972). Somewhere different for a wedding? All of its conquerors, from the Romans through Napoleon to the Hapsburgs, have admired its wines but, newly independent, Slovenia is struggling to cash in on its glory days. Firstly because only Slovenes and their immediate neighbours in Italy, Austria, Croatia and Hungary can pinpoint the country on a map and, secondly, because Yugoslavia’s ruler, Josip Broz Tito, squandered its reputation by insisting on quantity. “Forty years ago it was enough that it was wine,” Mateja Kocijančič of Zanut explains. Her husband, Borut, is another one of the promising new crop of winemakers who are poised to restore its reputation for fine, fascinating wines. His father made wine for the family restaurant but now Borut, formerly a butcher, is cutting it in export markets with wines that seem modern yet respect local traditions: grapes grown from local clones, every bunch hand-harvested, reds aged in large (500L) oak barrels, whites that are either fresh or complex, created by home-grown yeasts. “We don’t have the fame of other countries, so we have to work harder,” says Neja Škrinjar, marketing and export manager at Klet Brda, the country’s largest wine producer with an annual output of 8-10 million litres. The Goriška Brda wine cellar was founded in 1957 as a cooperative and is still owned by 400 grapegrowers. Their flagship grape is Rebula (Ribolla Gialla), the most widely planted vine in the Goriška Brda area, the main white in the Vipava Valley, and the pride of the west. Klet Brda’s newest expression of this variety, Motnik, is a prime example of the way the region melts modern and traditional winemaking as it uses barrels smoked clean by an old recipe of local herbs. During my travels around the west of the country, I tasted Rebula in all its guises – from sparkling (Ferdinand) to fresh and dry (Ščurek, Marjan Simčič, Edi Simčič and Zanut), from macerated and orange (Ferdinand, Movia and Marjan Simčič) to lushiously sweet and made from dried grapes (Marjan Simčič and Štokelj). It’s a grape that thrives in the mineral-rich opoka soil and complex climate here: This is where the Alpine, Mediterranean and Continental climates “shake hands”. When made in the modern style “without skins” and in stainless steel tanks, Rebula produces a very pleasant, simple, clean, fresh wine, with mineral undertones, subtle floral aromas and high acidity. When skin contact is used to replace packet yeast and sulphur dioxide, it makes a very complex, age-worthy white. Ferdinand’s MRR (in which the grapes are macerated for a year! ), Movia’s Rebula Lunar and Marjan Simčič’s Ribolla Selekcija are extreme wines with a deep amber colour, honeyed-fruit flavours, hints of nuttiness, rich minerality and thick texture, but they should be on every wine lover’s bucket list. The east has its own signature grape too. Furmint is best known for its contribution to Hungary’s delicious dessert wine, Tokaji, but in the northeast of Slovenia, where it is called Šipon, it is used to make a dry white wine with aromas of apples and pears and a fruity, spicy, minerally taste. The beautiful terraced hills around the tiny village of Jeruzalem are where the best expressions are found from companies such as P&F Wineries, Dveri-Pax, Verus and Krainz. This means the producers in them thar hills can also make lovely wines from other aromatic varieties, including Sauvignon Blanc, Riesling, Pinot Gris, Pinot Blanc, Traminer and Yellow Muscat. The requirement on winemakers in the east is to preserve the aromas, flavours and freshness that nature has dealt them. At P&F’s seven-storey cylindrical cellar in Ormož, the whole process – from crushing to bottling – is carried out in the absence of oxygen and at cool temperatures. Gleaming stainless steel and pure varietal expressions rule here. At Verus, a producer set up by three friends who defected from the local cooperative to express the truth of the local varieties, the only varietal that sees wood is Pinot Noir. Pinot Noir is the only red that thrives in both the east and west. I have seen some experimentation with it (the top own-made wine at one of my favourite restaurants, the Taverna near Jeruzalem, has a Pinot Noir-Merlot blend that has been matured for 25 months in mulberry), but, generally, the goal is elegant Burgundy-style Pinot Noirs. A stronghold for Pinot Noir is the Vipava Valley in the west, a 30-mile-long rift blown dry by a strong north-easterly wind called the ‘burja’. Typically reaching more than 120km/h, it is a great asset to the valley’s high concentration of organic grapegrowers. “Anything under 100km/h is a breeze,” jokes Primož Lavrenčič, whose family has been making wine here since 1499. 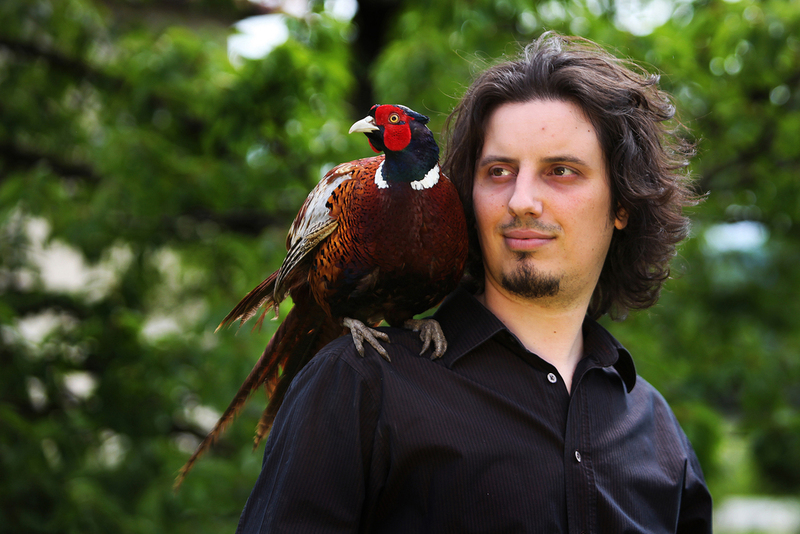 A part-time lecturer in viticulture, Primož has branched out from the family wine business, Sutor, and started Burja Wines. He describes his Burja Noir as “my passion and my joy” and believes the climatic mix in the valley is ideal for producing elegant Burgundy-style reds. 2015 is going to be an exciting year for Primož as he plans to build a new winery in which the juice, must and wine are moved by gravity. Another part-time lecturer who is growing an international wine business and farms organically in the valley is Matjaž Lemut of Tilia. He makes Pinot Noirs which vary in price from €6 to €40. “I’m not reaching for richness, I’m reaching for stability,” he told me. He also has a growing reputation for his Bordeaux blends, but seems most excited about the potential for blending the valley’s other main red variety, Barbera, with Merlot. “Merlot gives stability and Barbera gives richness, freshness and fruitiness,” he explained. Slovenia is predominantly a white wine producer (68% according to the latest official figures), but it has been ceding ground to reds by about 1% a year over the past few years. Generally there is less experimentation with reds in both the east and west. But there are still differences. The northeast (Podravje) offers good examples of the Austrian reds, Blaufränkisch (called Modra Frankinja locally) and Zweigelt, while the southeast (Posavje) specialises in the light red, low-alcohol, high-acid peculiarity that is Cviček. This is a blend of 70% reds (such as Modra Frankinja and the grape grown on Maribor’s old vine, Žametna Črnina) and 30% whites (Kraljevina, Laški Rizling, Rumeni Plavec, Zeleni Silvanec, Ranfol, Lipna). Basically, it’s a mixture of the old varieties that survived phylloxera! Although 1.5-2 million litres are consumed annually in Slovenia, I still haven’t acquired the taste for it. But I can see wider appeal for the increasing number of fizzy versions. The west (Primorska) is best for Merlots (Marjan Simčič, Zanut, Batič) and Merlot-dominated blends (Tilia, Erzetič), but, on the right sites, some interesting Cabernet Sauvignons (Iaquin, Zanut) and Barberas (Burja) can be found. The southwest, Slovenian Istria, has some excellent examples of Refošk and Teran. Slovenian winemakers insist there is a difference even though the Wine Grapes bible says both are actually Terrano. My research found Croatian geneticists who say the DNA is slightly different and ampelographers who say the varieties are very similar. On top of that, many of the Refošk vines in Slovenia have been wrongly identified and are, in fact, definitely Teran while winemakers in the Kras region say Terrano is Refošk grown on red soil. Whatever the name and subtle differences, there are producers such as Vinakoper and Vinakras using the grapes to turn out elegant, fresh reds with lots of lively fruit. As for similarities, both the east and west are passionate about their local white varieties. The west comes out top with Pinela and Zelen, while the east has Ranfol. 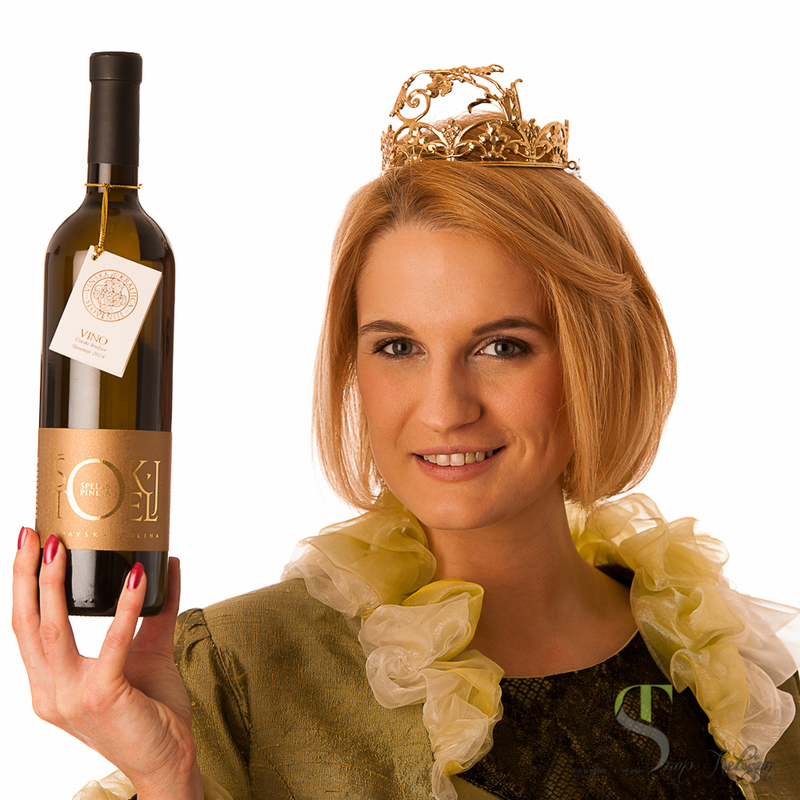 My favourite – fruity, flowery Pinela – got a boost in 2014 when it was the official wine of the Slovenian wine queen, Špela Štokelj. Another fifth-generation winemaker, Špela helps her father, Damjan, to make wine under the family name. Half of their 3ha is devoted to Pinela, making them one of the largest producers of this thin-skinned, sensitive variety. “It’s risky to have Pinela but we wanted to continue our family tradition,” Špela said. They make 5,000 bottles of fresh, light Pinela and this year plan to make 1,000 bottles of sparkling Pinela. I believe it could give Japan’s Koshu a run for its money. The east and west also have their own rare varieties for sweet wines – Pikolit in the west and Ranina in the east. All over the country you will find luscious dessert wines made by a variety of techniques (late harvest, straw and ice) and using a variety of grapes (including the country’s most widespread variety, Laški Rizling, as well as Riesling, Šipon and Rebula). Producers to look out for include Dveri-Pax, Prus, Pra-Vino, Zorin, and Marjan Simčič (whose Leonardo is on the Fat Duck tasting menu). The dessert wines I tasted in both the east and west rammed home my impression of the winemakers here. They are a talented bunch who have been raised on vineyards and have gone on to study oenology at university and then abroad before returning home to the terroir they treasure. They respect the country’s traditions and grape varieties and are passionate about what they do. Their care, attention to detail and dedication are impressive. To make one of my favourites, the Štokelj Ambrosia 2009, a team of more than a dozen volunteers spent two days sorting the healthiest dried Rebula grapes. You can drive from east to west, from Slovenia’s border with Hungary to Italy, in just over three hours and from its border with Austria in the north to Croatia in the south in less than two hours. It took me over a week and it could have taken a great deal longer as there are so many fascinating family-run wineries to visit here. On my travels I tasted some fantastic wines (this is, after all, a country producing 77% PDO quality wines), but the most impressive thing was the diversity of wines in such a small country. This may, in the end, make it more difficult to sell a Slovenian wine abroad, but it sure is fun going from obscure white blends to classic bargain-priced reds and from totally clean, fresh, fruit-driven wines with crisp acidity to heavily macerated biodynamic wines. Even children charging around the tasting room couldn’t diminish the enjoyment. And the wine that stood out most? The complex, tannic Batič Zaria, a field blend that is single-handedly saving some of the Vipava Valley’s oldest white grapes: 55% Pinela, 20% Zelen, 10% Rebula, 8% Vitovska, 4% Klarnica, 2% Chardonnay, and 1% Rumeni Muškat. The wine is matured in old Slovenian oak barrels, which are not topped up. The wine is bottled without filtration and sulphur dioxide. Miha Batič says it represents “the new dawn of ancient wine culture”. I really hope so! Slovenia - the best country for wine tourism. More to come as we continue to build and improve this website. More to come as we continue to build and improve this website.. Your recommendations are also welcome.